British National Mountain Bike Champion and on home soil. Feels good! 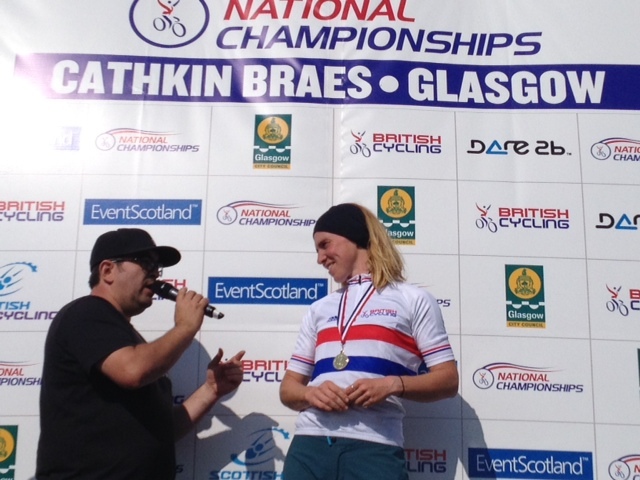 Yesterday I won the British National Championships at Cathkin Braes in my home town of Glasgow. I have never been more nervous before any race in my life and am so pleased with the outcome. I led the 6 lap race from the start with the former downhill world champion Tracy Moseley on my wheel for lap 1. After finally managing to get a gap on Tracy I just kept the pressure on to build my lead over the remaining laps. But my heart was in my mouth on the penultimate lap when my gears jammed and I spend what felt like a fortnight trying to pull my chain out from my frame. By then I had enough of a time buffer to survive so I just concentrated on keeping it smooth on the remaining lap. Coming over that line to the cheers of a Glasgow crowd felt incredible. A dream come true. Well done to Jane Nussli and Tracy Moseley on 2nd and 3rd spot and to all the other British champions in their respective categories. Enormous thanks go out to my family and partner, Ferga, who have to put up with so much beyond the call of duty.